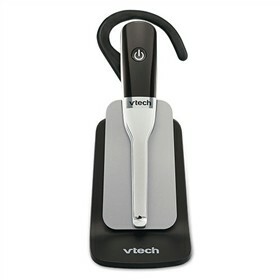 The VTech IS6100 cordless headset comes with DECT 6.0 technology for interference free communication, enhanced security and wider range. This device is very unique in that it is designed to be worn as a headset, but can function as an extra handset. Answer incoming calls with the IS6100 when paired with a corresponding DECT 6.0 telephone. The IS6100 can adjust to the needs of more than one user and be worn over the ear and over the head. It filters out unwanted background noise for the highest possible audio quality. The headset is lightweight and the battery provides up to 9 hours of talk time and 90 hours on standby mode. Requires the LS6315, LS6325, LS6435, LS6475 or DS6421 series to operate. This cordless headset can be placed anywhere in your home or office where you have an electrical out let and does not require a phone jack. The VTech IS6100 has many exciting features for users of all types. It's one of FactoryOutletStore's best selling . You can extend the lifetime of your VTech IS6100 with the purchase of a FactoryOutletStore Factory Protection Plan. See the VTech IS6100 product video and gallery images above for more details. The VTech IS6100 is sold as a Brand New Unopened Item.